Craig Dawson continued his fine start to life at the Reebok Stadium as Bolton left Peterborough in trouble at the bottom of the Championship. 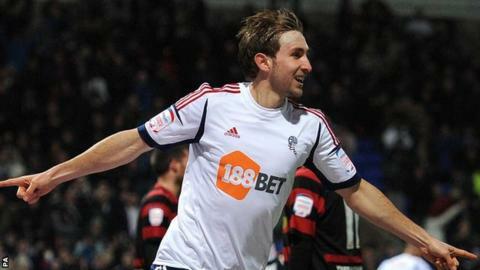 The defender scored twice in and scored the only goal on Tuesday, heading in from Jay Spearing's early corner. Peterborough are now four points from safety at the foot of the table. Improving Bolton are up to 10th place, with Dougie Freedman's side seven points off the play-off places with 12 matches remaining. They took the lead when Spearing's corner from the left was cleared, but his second delivery found Dawson who headed home. Wanderers winger Lee Chung-yong forced Posh goalkeeper Bobby Olejnik into a fine diving save as Peterborough offered little attacking threat. The visitors enjoyed plenty of possession as the final whistle approached but never seriously tested Bolton keeper Adam Bogdan as they slipped to a second straight defeat. "For me the signs were there that the training ground work we do day-in, day-out is paying off. "To a man, we worked very hard and made it difficult for Peterborough to have any clear-cut chances. "Our defensive display has got to be talked about because we were asked a lot of questions." "We need six wins and we need them quick, but my players can win games. We can win games against any team in this league; we've shown that. "This is what you're in the game for. This is the business end of the season. "It's the bit I enjoy and it's the bit the players have got to enjoy. "They have to enjoy the challenge of trying to keep the club up because the difference - and no disrespect to League One - between this league and the one below is absolutely gigantic."